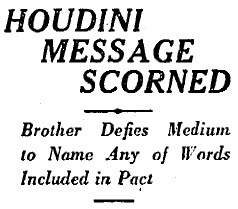 Egyptian mystic Hamid Bey claims to have received a message from deceased illusionist Harry Houdini – but Hardeen, Houdini’s surviving brother, doesn’t believe that Bey’s claim is any more genuine than many others made since the magician’s death last Halloween. Hardeen would love to hear from his brother Harry, and has offered $10,000 ($119,510.92 USD 2007) to anyone who can name only one or two words of a secret code which he devised with Houdini, and another deceased brother, William. The brothers entered into the pact prior to William’s death last year in order to prove that the dead cannot communicate with the living. They agreed that the code would be the preamble to any communication from beyond the grave. Hardeen said that he and Houdini never heard from William following his death. Bey has spent most of this year on the vaudeville circuit performing feats such as being buried alive and then revived. Mr. Bey asserts his powers are divine gifts, and he had intended to challenge Houdini’s well documented skepticism of spiritualists. Throughout his life Houdini had scorned spiritualists and had often stated that he could duplicate, by mechanical means, any of the stunts performed by a medium. Unfortunately Houdini died before the two could meet. 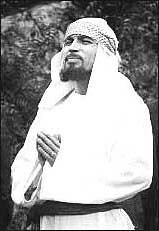 Prior to his current stint in vaudeville, Bey spent a few years traveling around the world publicly demonstrating powers had he learned at a Coptic Temple in Egypt. While in Brindisi, Italy, he had a near death experience. He had announced that he was going to induce a state of suspended animation, and allow himself to be buried alive for three days. His plan to fast prior to his entombment was foiled by the residents of Brindisi when they prepared a sumptuous banquet in his honor, and pressed him to eat several large plates of spaghetti. When he awakened from his trance he was buried and unable to breathe – he then pulled the emergency cord which rang a bell above ground to summon help to his gravesite. Bey later stated that his trance had been disrupted by the spaghetti he had consumed. Were cosmic forces responsible for interrupting Hamid’s trance, or were a bad case of indigestion and a subconscious desire not to remain buried under six feet of Italian soil the reasons for his premature resurrection? It is a shame that fate intervened and denied us the outcome of a confrontation between Hamid Bey and Harry Houdini. Houdini’s wife Bess held a séance on Halloween every year through 1936 when she declared that “ten years is long enough to wait for any man.” No authentic message from Houdini has ever been received. < 1947project Podcast #2, June 16 2007	> How Far Will These Modern Artists Go?